Cologne Grand Siècle is no. 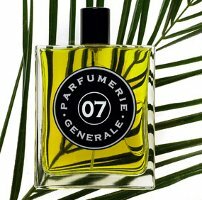 7 in the Parfumerie Generale line, which now comprises 15 fragrances. It was launched in 2005 and has notes of tangerine, bergamot, bitter orange, grapefruit, lemon, cardamom, herbs, ylang ylang, dry woods, vetiver and wheat. I am very fond of classic colognes. The term cologne is now used somewhat generically to indicate any fragrance with a concentration that is less than an Eau de Toilette (usually that means less than 5%), but here I am referring to the descendants of the original, citrus-based Eau de Cologne first created in 1709 by Johann Maria Farina, an Italian perfumer who had settled in Cologne, Germany. According to Parfumerie Generale, perfumer Pierre Guillaume limited his palette for Cologne Grand Siècle to natural, certified organic ingredients that would have been accessible in the 18th century. Given that, you would not expect it to be a startlingly unusual fragrance, and it isn't: it is a very nicely done rendition of a classic cologne, with dry sparkling citrus, a handful of spices and herbs, and a mild woody-earthy base. And while I most wholeheartedly admit that I probably wouldn't know the difference, it smells like it was made with natural ingredients. The lasting power is not spectacular, but it is far better than most Eau de Colognes, and the citrus notes especially seem to linger longer than you would expect. Cologne Grand Siècle also layers beautifully with one of my other favorites from this line, L'Eau Rare Matale (and I hope to do a comparison with the newer, more concentrated Hyperessence Matale soon). Cologne Grand Siècle is available in 50 and 100 ml bottles of Eau de Toilette. For buying information, see the listing for Parfumerie Generale under Perfume Houses. I like this line quite a bit. I ordered samples of the ones they'd picked for me, based on my filling out their questionnaire. I almost bought a couple of them, but wasn't completely in love, so didn't. I'll bet I end up buying something of their while I'm in Paris. This one sounds very pleasant. Robin, have you tried Balmain de Balmain? Between yesterday's review of Cristalle and this review, it just occurs to me that BdeB fits right in. It's a really cologne-y perfume, green and citrusy. I don't seem to see much about it anywhere. I really like this one! I actually liked most of PGs. I don't think there was a single one I actually disliked. I am looking forward to your comparison of the two Matales. For some strange reason those were the two that impressed me the least. I liked them, but…I don't know… they didn't wow me. L, which others did you like? I am hoping these eventually get picked up by one of the US retailers. A, I have not. I have a sample of the Monsieur Balmain waiting patiently to be tested, and it sounds like it might be a nice citrus too. Seriously, even with the newer releases, the Matale is easily my favorite from the line. Here I'd like to put in a plug for the fabulous Nasrin at the http://www.theperfumeshoppe.com (I am in no way affiliated). Admittedly, this is a Canadian site, not US, but it has great selection, carries even the new PGs and the reponse time to queries and shipping are very quick. I second this recommendation! (I'm also not affiliated in any way) If anyone visits Vancouver, a trip to see Naz at the Perfume Shoppe is a real treat. She's very happy to spend time with you and will help you sample fragrances to your heart's content. The store also has a samples program which allows you to purchase sample vials on-line at a reasonable price. I haven't tried out any of the Parfumerie Generale fragrances – I don't know why but they just don't grab me for some reason. Today's featured scent sounds really nice though. Nice to see 2 happy customers! She has a great selection, and wish I could visit the store. I haven't tried this one; frankly, it sounds too citrusy for me. I just received my set of Chapter 2 minis, though, and am very excited! So far I have tried Aomassai (love) and Iris Taizo (deep like). Iris Taizo coming up later today, LOL…Aomassai I am still making up my mind about. I love that they sell the little minis…and glad you are finding favorites! I am still trying to decide about Aomassai.